If anyone is crazy then it is that idiotic group that calls themslves Christians – that anglican so called church – but then again anglicanism has lost the plot completley. How can you love Christ like they claim and completely debase Christ’s mother? Seems it is a den of weirdos and the leader should be booted out. He has already offended many other people with his billboard antics …and then he has the audacity to say people should be more “tolerate” lol If that is the case THEN LET HIM be tolerant to others to happen Christ and his mother and would never offend either of them intentionally. Debasing Chrst’s mother is no different to debasing your own mother. 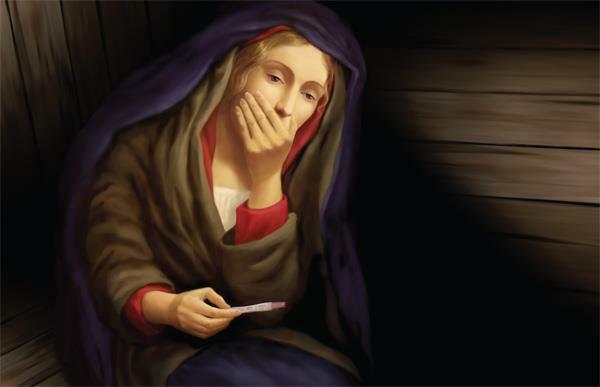 I am still confused as to why looking at a pregnancy test is debasing…. my mother may well have looked at a pregnancy test… I don’t know. I assume she had some sort of confirmation from some medical test at some time in her pregnancy. I don’t see affirming this as debasing my mother…. so why does it debase Mary?. I’m not sure that the doctrine of the virgin birth is ludicrous, but that looks like nothing more than a vandalised picture to me. The idea that the animals are coming out of any part of her body sounds bizarre. ENOUGH of this “arthur skinner being a FUNDAMENTALIST” He is NOT ! he is a devout catholic who is standing up for his convictions. 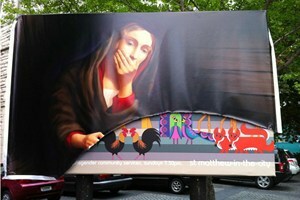 My goodness, the billboard depicts the Mother to God ( the belief of all Catholics The billboard is showing blasphemy and any Christian who is a truly a Christian Sould be angry — YES ANGRY ! Christians turn the other cheek much too much. Imagine if Islam or Judaism was being attacked on the billboard. You think it would stop at a mere slashing ? NO !! The church responsible for erecting it would have been burnt and most probable physical injuries would have been inflicted on its pastor. “fundamentalists” and “reactionary” etc. It is the so called Catholics who do NOTHING about blasphemy that should be criticised and not those who stand up for the Truth. I am not sure if Peter’s comment was ironic or not…?